OMG, no way, I weighed myself again this AM, and I am at 166.4 pounds! That’s another pound! Don’t know what I’ll be tomorrow AM, but this feels fabulous today! Soooo, this brings my grand total to….drum roll please……33.5 pounds total! Yikes! I am getting closer and closer to my goal weight of 160 pounds! It still feels surreal! I still can’t believe that so many months ago, I was at 200 pounds, with no intention of ever changing, thinking I could never do it! And here I am 33.5 lbs later and it’s amazing. THANK YOU THANK YOU THANK YOU!!! Author debbie @ That's Just MePosted on January 28, 2010 Categories Weigh inTags feelings, healthy, Weigh inLeave a comment on 166.4 Lbs – Whoa! This video from ABC News is very disturbing, but it’s great that someone is finally speaking up for the animals! It’s one thing that we use animals for food, but why can’t we treat them with respect during their time on earth? After all, they are sacrificing a lot to give us sustanance, so why should they live in horror!? I don’t know if buying organic dairy is any better, but the animals have to be treated better than normal dairy cows. Poor cows! It breaks my heart when I think of this stuff. We are a gluttonous nation, and if we just eat and drink a little less, we could save a few cows from having such a miserable life. Save calories, save animals, save the environment! Author debbie @ That's Just MePosted on January 27, 2010 June 12, 2010 Categories FoodTags cows, dairy, feelings, FOOD, organic, unhealthyLeave a comment on Got Milk? Got Abuse? Made some wonderfully simple baked chicken with shallots tonight. Very easy and simple. 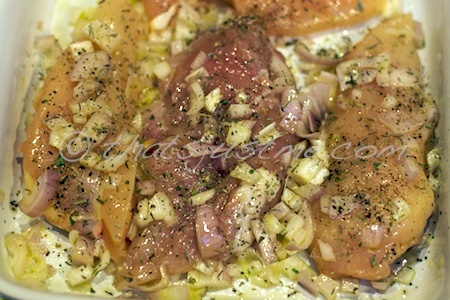 Add Chicken pieces, flip to coat both sides of chicken with oil and shallots. Spoon shallot mixture over chicken. Season with spices, salt & pepper. The other day, I bought a ready-made “Rustic Crust” brand thin pizza crust. I know it’s not completely homemade, but the list of ingredients were very good: Unbleached/Unbromated Wheat Flour, Water, Natural Culture, Semolina Flour, Whole Wheat Flour, Sea Salt, Honey, Yeast, Organic Soy Oil, Olive Oil. Yes, it’s white flour, but it’s pizza! Come on! I would have liked to get the whole wheat crust, but it was more calories. This was thin and crispy and absolutely delicious! 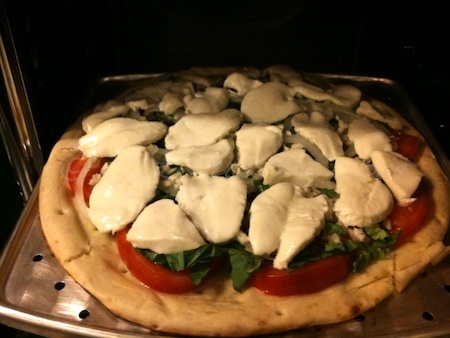 fresh mozzarella (about 8 oz, sliced) – I will use less next time, and possibly some Parmasan Reggiano as well. This photo doesn’t do justice to how wonderful and fresh it looked going into the oven. Beware! 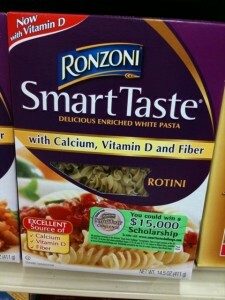 Ronzoni Smart Taste Pasta Changes Their Ingredients! Most of the time, I use Ronzoni Healthy Harvest whole wheat pasta, but sometimes you just want something that tastes like good old fashioned white pasta, so I also keep Ronzoni Smart Taste pasta in the pantry. I just finished off a box, and glanced at the ingredients list before I tossed it into recycling. What? Something is very wrong here! BHA & BHT along with Fractionated Coconut Oil?? I know I would never have purchased a product with those kind of ingredients! What happened? I looked at another box, and those ingredients were not listed! The only difference between both boxes was it was now listing “Now With Vitamin D” – so to include Vitamin D, they have to also add icky toxic preservatives and Fractionated Coconut Oil*?! Not happy Ronzoni! The reason I am not happy about “fractionated” coconut oil is because it’s refined with heat, not cold pressed. I like coconut oil, but it’s gotta be extra virgin for me to consume it! Out of protest, I will not be purchasing ANY Ronzoni products! It’s sneaky and deceitful how they dramatically changed the product like that! Once the cupboard needs a pasta refill, I will switch to a more reputable brand! Brands include Healthy Harvest®, Ronzoni®, Smart Choice®, San Giorgio®, Creamette®, American Beauty®, Skinner®, Prince®, Catelli® and Lancia®. In 2006, the Company became a wholly-owned subsidiary of Ebro Puleva, S.A., one of the world’s leading food companies. Ebro Puleva’s other subsidiary in the United States, Riviana Foods Inc., has such well-known brands as Mahatma®, Carolina®, Success®, Minute® and Gourmet House®. So, needless to say, I will also be staying away from their other products as well, not that I buy any of them now, but I surely won’t in the future! I happened to be at the grocery store the other day, and I noticed the Smart Taste pasta. I was curious, so I took a look at the ingredients again. Wow! No more BHA & BHT perservatives, Fractionated Coconut Oil. Amazing! I still don’t trust them, since they added these ingredients in the first place without warning, so I am still staying away from their products. They really never should have added these bad ingredients, but it’s nice to see them taking them out of their pasta! Author debbie @ That's Just MePosted on January 26, 2010 November 27, 2010 Categories Food, ReviewsTags chemicals, FOOD, junk food, pasta, Ronzoni Smart Taste, unhealthy10 Comments on Beware! 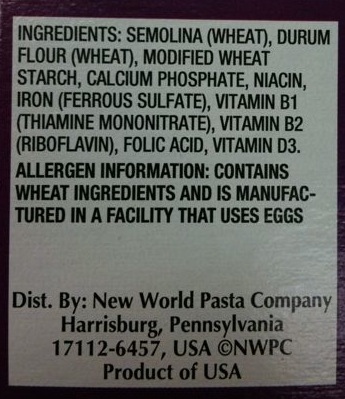 Ronzoni Smart Taste Pasta Changes Their Ingredients! So, my DH gave me a Nintendo Wii for Christmas, along with the Wii Fit game. I have been doing it fairly regularly and it’s been pretty good. I really really love the strength and yoga training. I love that I can save a bunch to “My Routine” and do a bunch one after another. If I use the treadmill, I like setting up the Wii to work on strength and yoga afterward. The other Wii Fit “games” are pretty good, but they don’t always get my heart rate going, but I do burn calories! I enjoy biking, and the Rhythm Parade is a good warm up! Hula Hoop is fun, and Boxing and Kung Fu is really fun, but I do feel uncoordinated! I can’t even do the Basic Step, I am totally off and can’t get my head wrapped around the steps! eek! I am working on my balance, and I have improved, but still have some work to do. Tonight I really had a great strength yoga work out. 31 minutes and I was shocked that I burned 123 calories! So far, I love the Wii Fit. Glad I have it to enhance my workouts! Well I lost 32.5 lbs! Holy crap this is cool. I weighed in on the wii yesterday morning and was shocked to see such a low number! I weighed again on the digital scale and the same! Yahoo! I made some changes on my profile stats everywhere. On the wii and on myfitnesspal.com to reflect 5’8″ instead of 5’9″. In reality I am 5′ 8.5″ so I figured that i’d go low. I am almost at a normal healthy BMI and I would be there already if I kept it at 5’9″ but I want to be accurate! I did have a small bowl of walnuts and Stonyfield Cookies & Cream frozen yogurt this afternoon. I still have 800+ calories left in my day, but somehow I just want to throw it all away and eat something baaaad! But I won’t! I just have to remember how good I feel. Yep, I feel healthy and strong. My work out last night was good! I don’t want to lose it all! Oh well, just ranting and expressing my feelings. I am not always as confident as I think I am everyday!!! ETA: Yay. Doing good. We’re getting Chinese take out but I’m getting my fave steamed chicken & veggies with brown rice. Yum! Hot & sour soup too! I was so happy that my mom gave me a Cuisinart Pro Classic 7-Cup Food Processor for Christmas. I was planning on purchasing one after the holidays myself, so it was a wonderful surprise. I wasn’t sure if the 7 cup would be large enough for everything I wanted though. Meatloaf, bread, cookies, salads, etc. So, I asked her if it was okay if I exchanged it for a larger model; my mom agreed. I scoured the reviews on Amazon.com“>Amazon.com and a bunch of cooking forums like Chowhound and Cooks Illustrated. I was pretty sure I was sticking with a Cuisinart, but which size and model? At the end of it all, I chose the Cuisinart Prep Plus 11 cup Food Processor, but first let me take you through the process (no pun intended) of my decision. Be warned, it’s long and detailed. Maybe too many details for most! If you want to forgo all the details, skip to My Findings. Before seeing any food processors in person, I was very confused but I managed to create a list of pros and cons for a few of the models, including the new Cuisinart Elite 12 cup and Elite 14 cup food processors. I love the concept of eating clean! When you eat whole (clean) foods, you naturally lower your sugar, salt, and calorie intake. I started off slowly, and it’s now become a lifestyle. Something I hopefully can follow for the rest of my life. And isn’t that the point of a “non-diet” – something that you can keep doing forever? Now, let me be honest. I am not a rigid 100% clean eater. Processed foods do make their way into my diet occasionally, but for the most part, I try to eat as clean as possible. And I think that is how most people would as well. Anyway, about the Eat Clean books by Tosca Reno . I guess I did things a little backward. I started learning about eating clean from online web sites and and I subscribed to Clean Eating magazine. In retrospect, I am glad I did it this way, instead of reading Tosca’s books first. I think I might have been scared off by the whole concept. I received the The Eat-Clean Diet: Fast Fat-Loss that lasts Forever! book from the library. While it’s a beautiful book, with great photos and colorful pages, it’s much too rigid. There are way too many restrictions like chocolate, fat (butter), egg yolks, beef, potatoes, and cheese. No eating after 6pm? We always have a light snack after dinner while watching TV. Eating 5-6 daily meals (one meal every 2-3 hours) isn’t for me. I eat 3 regular meals plus snacks, and I don’t normally go over 500 calories for any meal, but Tosca suggests each meal to be 300-400 calories. If I divided my daily calories into 5 meals equally, I would only be eating 300 calories each meal. Tosca also promotes non-stick cookware and bakeware, which I find to be dangerous to living things and the environment. I don’t know why a lot of chefs recommend non-stick, but it’s not something I like to use except for eggs and the occasional pancake breakfast. I would rather use a little more olive or coconut oil instead. I don’t particularly care for some of her supplement recommendations either, like HGH (human growth hormone) and creatine. There’s just too much emphasis on body building and protein consumption. At this point in my life, I don’t desire to have a body like Tosca’s. While I admire her and all the work she puts into maintaining her fabulous muscles, I just don’t think it’s relevant to my particular lifestyle. But that’s not to say I won’t want to accomplish a buff body later in my life. I just don’t know! Everyone knows for weight loss to work, you need to make it a lifestyle change, but this concept feels more like a dreaded “diet” to me. Too many restrictions will make you crave those foods even more. I prefer my Clean Eating magazine subscription instead of this book. I love reading cookbooks, like some people love reading novels! I am inspired by recipes, and enjoy learning ideas from cookbooks; I like putting my own spin on a recipe rather than exactly following it. Please keep in mind that my opinions might be completely different from the other home cooks.